Through its Campaign for Access to Essential Medicines, Doctors Without Borders/Médecins Sans Frontières (MSF) has been closely following the developments in the world of access to medicines, vaccines and diagnostics. Among the positive stories of the past year: new tools were developed for Meningitis A and for tuberculosis, promising research was published on severe malaria, an innovative mechanism was created to make lifesaving HIV medicines more affordable, and the quality of food aid is progressively improving. But it wasn’t all good news in 2010: donors are turning their back on AIDS, and pursuing a number of policies that threaten access to generic medicines (here and here). At the same time, measles is making a comeback, and neglected tropical diseases continue to take a heavy toll. Continue reading below for the full selection of the ten stories that mattered in access to medicines in 2010. A new, highly-effective vaccine launched in 2010 now offers the hope of an escape from one of the most fatal forms of meningitis in Africa – and it was developed not by one of the big pharmaceutical companies, but thanks to a partnership between the non-profit organization PATH and the Serum Institute of India which ensured it would both meet the needs of people in Africa and be affordable. By providing long-term protection against the disease being passed from person to person, the new meningitis A vaccine will effectively prevent epidemics to begin with, This will transform the work of MSF and of ministries of health, allowing us to move away from scrambling to stop the spread of an existing outbreak with treatment and vaccines that provide only short-term protection, towards a new strategy of launching preventive campaigns before outbreaks even emerge. Vaccines are usually developed with the medical needs of wealthy countries in mind, and only brought to developing countries much later, where they are often sold at high prices. 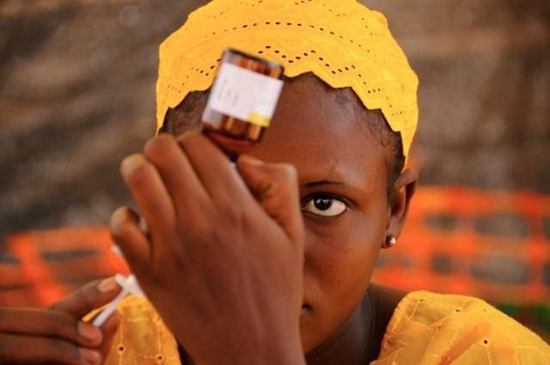 But this vaccine was designed specifically to meet the medical needs in Africa’s ‘Meningitis Belt,’ a stretch of 25 countries from Senegal to Ethiopia. The different groups that worked together on the vaccine’s development ensured from the outset it would be sold at an affordable price: less than fifty cents per dose. 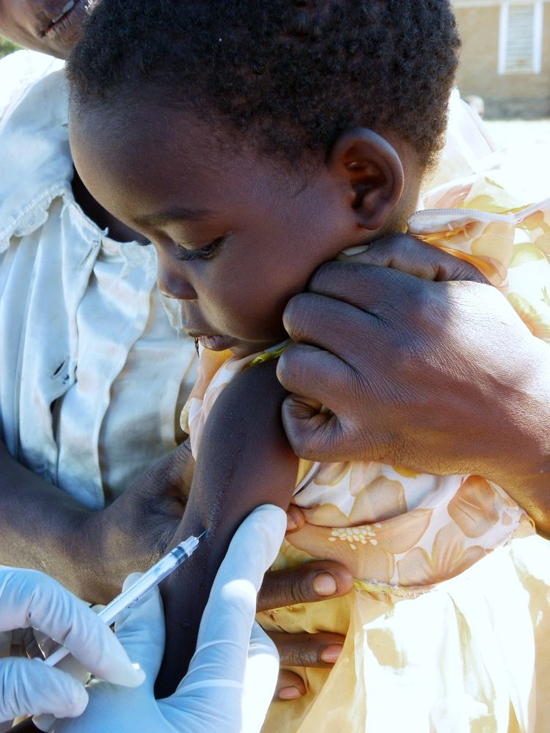 In December 2010, MSF began supporting initial vaccination campaigns in Mali and Niger. But the international community has yet to develop plans and ensure funding to extend vaccination across all affected countries in Africa. A new test for tuberculosis that became available in 2010 will make diagnosing a curable disease that kills nearly two million people every year much faster, easier and more precise. At present, confirming that a person has TB usually involves a 130-year-old test to examine under a microscope the phlegm coughed up by patients. But this method fails to detect TB in about half of all cases – particularly in people living with HIV. And for the growing number of people with drug-resistant forms of the disease, it can take up to three months to get an accurate result – by which time many will have died. The new test will cut this time down to less than two hours, will show if the strain of TB is resistant to one of the most common medicines used for treatment, and will greatly improve the ability to diagnose TB in people living with HIV. This test represents an important breakthrough, and should be used widely in HIV and TB treatment programs. But a simpler and cheaper test is still needed: the new test remains a sophisticated piece of machinery that requires access to electricity and complex maintenance. Even at discounted prices, the machine costs US$17,000 and each test device costs $17. This means it is too expensive to have in every clinic and can not be used in the most remote settings. MSF was involved in testing this new diagnostic in its project in Khayelitsha, South Africa, and will purchase machines for its TB and HIV projects. But MSF will also continue to push for the development of a fast, simple, affordable diagnostic test that delivers results on the spot, and does not require sophisticated laboratory equipment. However, the development of such a ‘point-of-care’ test likely remains several years away. 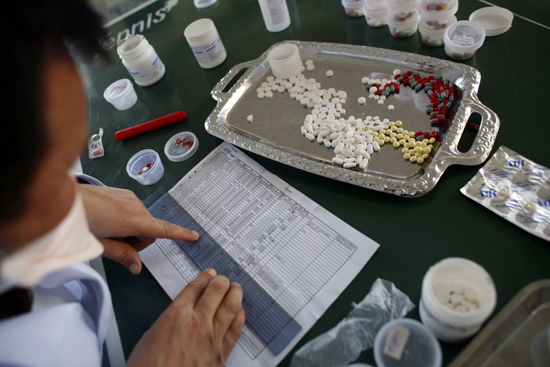 In a move that could boost access to affordable medicines in the developing world, the Medicines Patent Pool was formally created in July 2010, and promptly received official backing from the US National Institutes of Health (NIH) two months later. MSF has been actively campaigning for the creation of the Pool since 2006. MSF treats over 160,000 people with HIV across the developing world largely thanks to the availability of affordable generic medicines. As people on treatment become resistant to their drug combinations over time, access to newer medicines is constantly needed – but these are more expensive. The mission of the Medicines Patent Pool is to facilitate the production of cheaper medicines for the developing world, by allowing generic manufacturers to produce copies of patented drugs, in exchange for royalty payments to the rights holders. The goal is also to support the development of urgently-needed formulations that don’t exist, such as ‘fixed-dose combinations’ that combine two or more medicines into one pill, or adapted formulations for children. The US NIH backing came with a decision to license its rights on the AIDS drug darunavir to the Medicines Patent Pool. This is an important first step, but other patents need to be put in the Pool to ensure people can receive affordable treatment in the long run. Drug companies must now step up and put their patents in the Pool. In 2010, a particularly devastating hunger season in Niger threatened the lives of hundreds of thousands of young children. The effective humanitarian response demonstrated just how far strategies to tackle malnutrition have improved in recent years. Five years ago, new strategies were introduced whereby all but the most severe cases were treated at home. 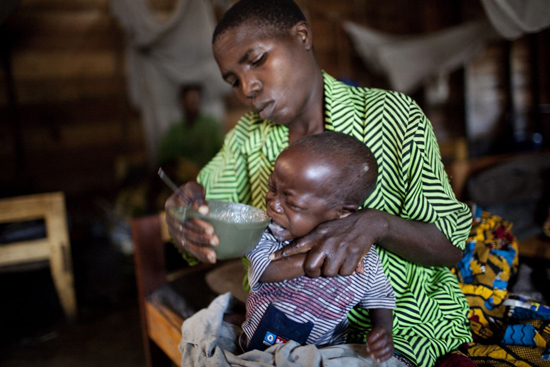 As a result, many more children could be treated for malnutrition than ever before. Since then, MSF has been trying out a new approach of distributing supplemental food to all children in a given area, with the goal of protecting them from malnutrition to begin with. In 2010, the government of Niger, UN agencies, and humanitarian groups such as MSF used this approach to target all children under the age of two – those most at risk of malnutrition. Children were given new supplements with the essential mix of protein (milk), fats, vitamins and minerals they need. During the crisis, the World Food Program (WFP) gave supplemental food to 525,000 children, and MSF distributed milk-containing food supplements to 150,000 more. Despite this success, most children receiving international food aid continue to receive products that aren’t adapted to their nutritional needs, as many of the larger donors continue to pay for or send inadequate foods. In June 2010, MSF launched a campaign called ‘Starved for Attention,’ in part to underscore the harmful double standard of a food aid system that provides children with nutritionally inadequate foods -- foods that would never be given to children in wealthy countries. The international community is responding to the pressure: in 2010, WFP purchased five times more supplemental food than the year before. Some major international food aid donors have already changed their policies, while others, like the US and the European Union, have said they are committed to ensuring that young children receive appropriate nutrition. MSF will continue to push until these urgently-needed changes are seen through. In 2010, international donors shifted their focus away from AIDS, threatening a decade of progress in treating the disease. 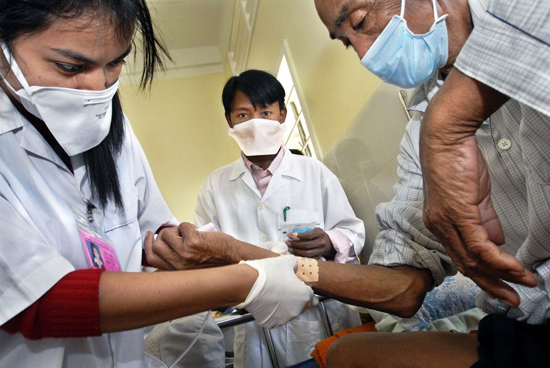 New scientific evidence and treatment recommendations reinforce the need to treat people earlier and with better medicines, both to prevent them from becoming severely ill, and to help reduce transmission of the virus among the population. Despite this evidence, there is a general trend toward backtracking on HIV funding, which will increasingly mean treatment delays, deferral, or denials. The Global Fund—the world’s principal funding mechanism for HIV treatment—faces a multi-billion dollar funding gap, and in December 2010 it rejected ambitious treatment proposals in high-burden countries where MSF runs AIDS programs, including Malawi, Swaziland, and Mozambique. The US President’s Emergency Plan for AIDS Relief (PEPFAR), the world’s largest funder of AIDS treatment in developing countries, has decided not to increase funding for the third year in a row. This retreat from AIDS comes after a decade of progress, with five million people on treatment today – a testament to what can be done with reliable donor commitment and the availability of affordable generic medicines. But as funding for global HIV/AIDS stagnates, and the price of needed newer drugs is on the rise, this very progress is at risk. A further ten million people are in urgent need of treatment and will die within the next several years if left untreated. MSF is urging governments to create innovative and sustainable financing mechanisms such as a financial transaction tax for health to support the Global Fund and global health. The European Union is pursuing a free trade agreement with India which will restrict Indian drug producers from making affordable generic medicines used to treat people across the developing world. In October 2010, MSF launched a campaign called ‘Europe! 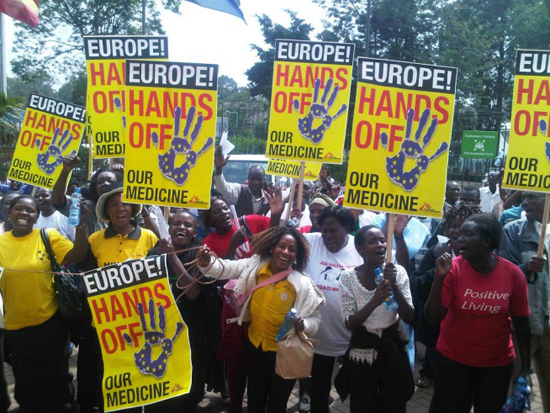 Hands Off Our Medicines,’ with the goal of getting the EU to back down. 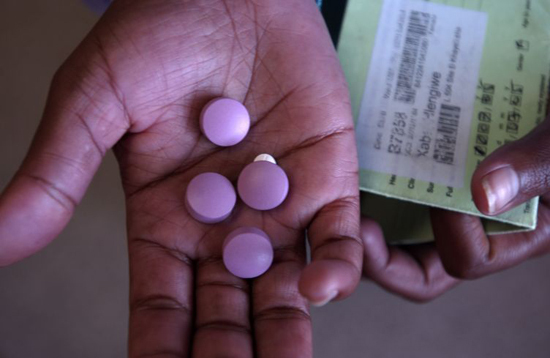 More than 80 percent of the AIDS medicines MSF uses to treat 160,000 people across the world are generics from India, and the treatment programs paid for by international donors rely on affordable Indian medicines just as much. But this is now under threat, as the EU pushes policies that will dry up the flow of affordable medicines. Europe is trying to undermine India’s patent law, which, in the interest of public health, only grants patents for medicines that show significant innovation – a fact that has long upset the pharmaceutical industry in wealthy countries. Drug companies have actively – but so far unsuccessfully – sought to challenge the law in Indian courts. Having lost in the courts, the companies are now using the EU’s trade policies to try to stamp out the competition from India. MSF can not stand by as its crucial source of affordable medicines comes under attack. People have taken to the streets in India, Nepal, Thailand, Indonesia, Kenya, and Europe in support of this campaign. The negotiations for the free trade agreement are ongoing and MSF will continue to speak out against these harmful policies. Take action by sending a letter to the EU’s Trade Commissioner Karel De Gucht, telling him to take his hands off our medicines! Go to action.msf.org. "Europe! HANDS OFF Our Medicine"
Fake medicines, which make false claims about what they contain or where they are from, represent a genuine problem. But in 2010, a number of initiatives that claim to deal with this problem have gone off course, by taking a trade approach to what is first and foremost a public health problem. So instead of actually dealing with the danger of fake and substandard drugs, they end up punishing access to quality generic medicines. When Kenya, for example, adopted a law to fight fakes, it chose a definition of the word ‘counterfeit’ so broad that the law risked including legally-produced, quality generic medicines. The net is being cast far too wide: the law could seriously endanger people’s health, as MSF and other treatment providers depend on a reliable flow of generic medicines to treat people in their programs. In April 2010, Kenyan public health activists won a first legal battle to challenge the constitutionality of the law, which is now under judicial review. But similar anti-counterfeit legislation is proceeding in Uganda and other East African countries. Further, a group of rich countries finalized in 2010 the Anti-Counterfeiting Trade Agreement (ACTA) which they want developing countries to sign on to. But hiding behind an agreement that claims to be about protecting the public from fakes is in fact a treaty that seeks to enforce intellectual property: ACTA will inhibit the production and distribution of affordable generic medicines by excessively punishing intellectual property violations, strengthening monopolies on medicines and enhancing the rights of brand-name pharmaceutical companies. The problem of substandard and fake drugs must be addressed, but not by harming access to generic medicines. What is needed is a clear definition of what fake medicines are so that the problem is not confused with trade issues, as well as measures that address the actual public health problem. And the far larger problem of substandard medicines must get greater attention. Promising news from the field of malaria research in 2010 shows that treating children suffering from severe malaria with injections of artesunate could save many more lives. Malaria kills around one million people every year, with nine in ten deaths being in young African children. Severe malaria, marked by serious symptoms such as coma, convulsions, or difficulty breathing, progresses rapidly and is particularly deadly. Those who manage to survive are often left with life-long neurological damage. Severe malaria is still mostly treated with the drug quinine, while uncomplicated malaria is treated with drugs containing derivates of artemisinin, an extract from a Chinese plant. In early 2010, the World Health Organization (WHO) strongly recommended that adults with severe malaria be treated with artesunate, a derivate of artemisinin, because it is more effective and has fewer side effects than quinine. Now, the results from a large trial in nine African countries provide strong evidence that children would also benefit from the newer drug. MSF is already treating severe malaria in children with a drug derived from artemisinin and will now widely introduce artesunate. Artesunate should be used to treat both adults and children with severe malaria so that many more lives can be saved. But wider obstacles remain: WHO treatment recommendations have yet to be revised in light of the latest evidence in children, and most countries have yet to recommend artesunate in place of quinine for either adults or children. And international donors have yet to put their full weight behind the latest evidence. For the past few decades, measles has been in retreat, prompting some to campaign for its global elimination. But events in 2010 showed the ambitious slogans have come too early. An often lackluster response to a surge of outbreaks in sub-Saharan Africa and insufficient funding means the disease is far from being under control. In 2008, more than 160,000 people died of measles, most of whom were children under five years. Measles is a highly-contagious disease that can emerge as soon as the vaccination coverage in a population drops below a certain level. Children in poor countries are at particular risk of complications and death. 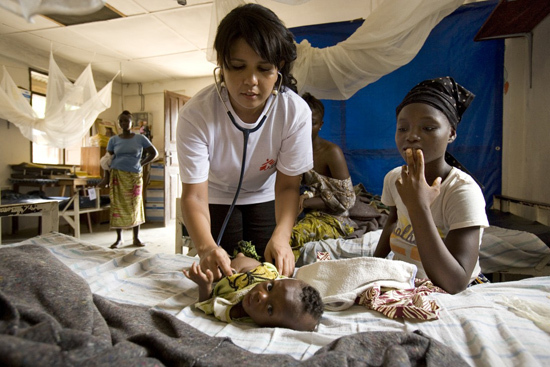 For years now, MSF has been at the forefront of responses, working with health ministries in many countries. 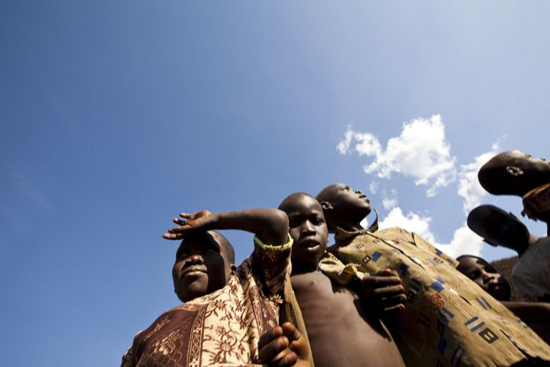 Outbreaks in 2010 struck many sub-Saharan African countries, including Chad, Malawi, Zimbabwe, South Africa, Nigeria, and the Democratic Republic of Congo. Particularly surprising about the recent resurgence of measles is that epidemics are occurring not just in war-torn countries, where health systems are weak and unable to cope, but also in stable countries where vaccination programs have been in place for a number of years. This shows that something is wrong with the current effort to fight measles. To make sure the progress achieved in recent decades is not lost, the disease must return to the spotlight. Controlling measles epidemics needs political and financial support for both routine services and outbreak responses. But these have been declining at a time when the price tag of US$1 to vaccinate a child makes measles control one of the most cost-effective health interventions available. 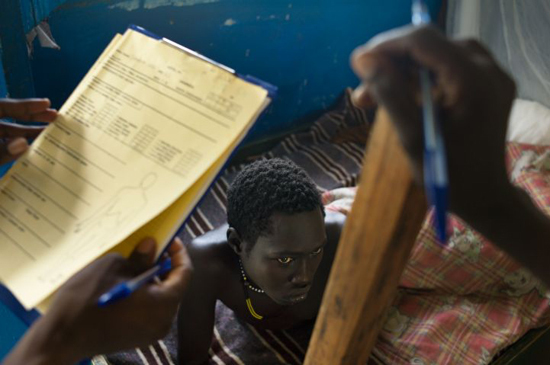 In 2010, southern Sudan battled to contain its biggest kala azar outbreak in eight years, highlighting the urgent need for newer, better tools to treat neglected tropical diseases in developing countries. Kala azar, or visceral leishmaniasis, is contracted through the bite of a parasite-carrying sandfly. Symptoms include an enlarged spleen, fever, weakness, and wasting. It thrives in poor, remote and unstable areas with extremely limited health care. About 500,000 new cases of kala azar are seen each year, and it is increasing as an opportunistic infection for people living with HIV/AIDS. Kala Azar: "A Disease of the Poorest of the Poor"
By the end of November 2010, MSF had treated 2,355 people for the disease in southern Sudan - eight times more than for the same period in the previous year. Untreated, kala azar is fatal in almost all cases within four months, but timely treatment has a very high rate of success (up to 95%). Although there are a number of treatment options, each carries significant limitations. Liposomal amphotericin B (AmBisome) is a highly effective treatment but its high cost restricts its wider use. The mainstay of treatment for most patients (except where there is high resistance) is 30 days of extremely painful intramuscular injections of antimony-based treatments with sodium stibogluconate (SSG), a highly toxic drug developed in the 1930s. Individuals infected with both kala azar and HIV experience higher toxicity and less effectiveness with existing drugs. The results of studies using combinations of existing drugs to optimize treatment and reduce cost and the development of resistance are expected shortly and could bring some short-term improvement. But what is really needed are new drugs that are less toxic, given orally over shorter periods and safe for pregnant women and women of child-bearing age.